There is a beautiful video by Jay of this aerial view.Click on the photo to see it on YouTube. just off the B1145. PE32 1EU. There is believed to have been a settlement on the site since the Iron Age . The Church is thought to have originated as a minster in the Late Saxon period and was built in the early and middle 12th century with the chancel being replaced and enlarged during the 15th century. The huge, gaunt dissected tower and aisle walls manifests a very fine Norman archway and a central bell tower. It was the parish church for the now deserted village of Bawsey but it is not clear if the medieval village houses were close to the church. The church is thought to have been disused by 1517 when the village of Bawsey had 60 acres of land converted to pasture. 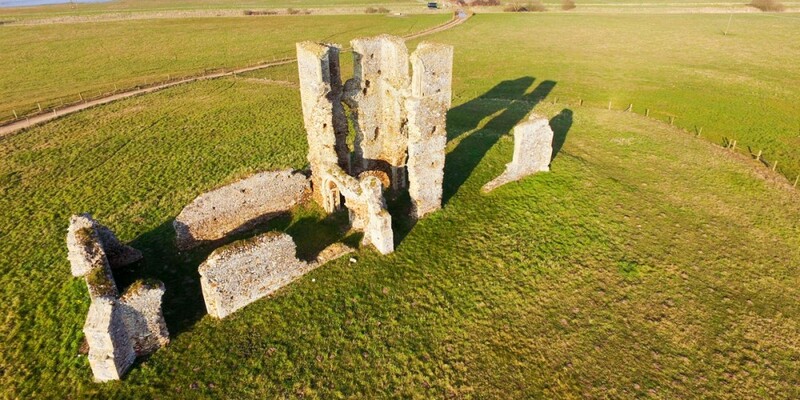 It is known to have been in ruins since before 1770. A thousand years ago, it was Norfolk’s equivalent of St Michaels Mount. In the Domesday Book of 1086 the settlement on the hill was probably that called ‘Boweseia’ (an Old English placename meaning ‘Gadfly island’) For in Saxon times it would have been accessed via a causeway, standing on a piece of high ground, surrounded by water on a headland on the estuary of the Gaywood river. Part of a thriving fishing village at a time when King's Lynn would have been in the sea. 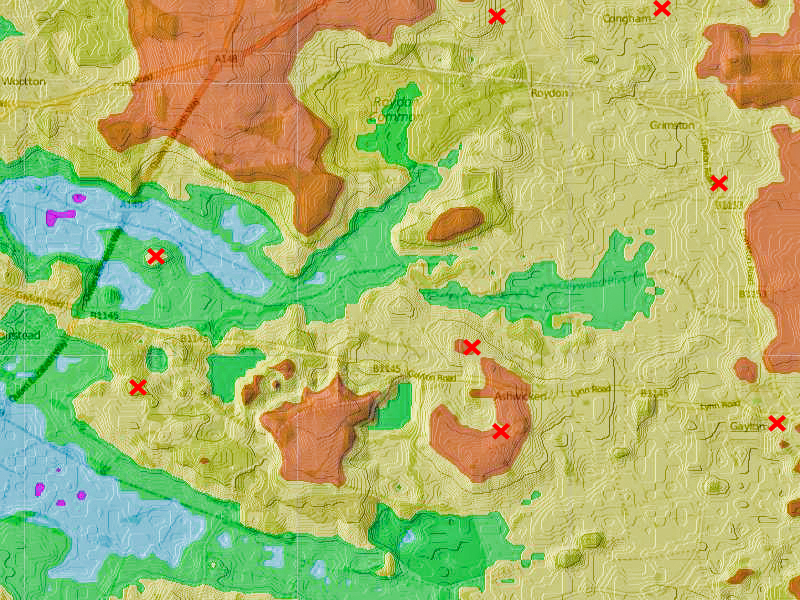 The topographic map above shows how the land would more likely have looked then with the water levels much higher than today. Lightly overlaid is today's road network along with the relative postions of our Churches in this part of the benefice. Bawsey is very clearly seen on its mount surrounded by water and so just to the South is Mintlyn. The Church just to the North of Ashwicken is the lost Church of Leziate. As the waters retreated the village fell into decline – reportedly helped by a landlord who demolished tenants’ homes to make way for the more lucrative sheep. 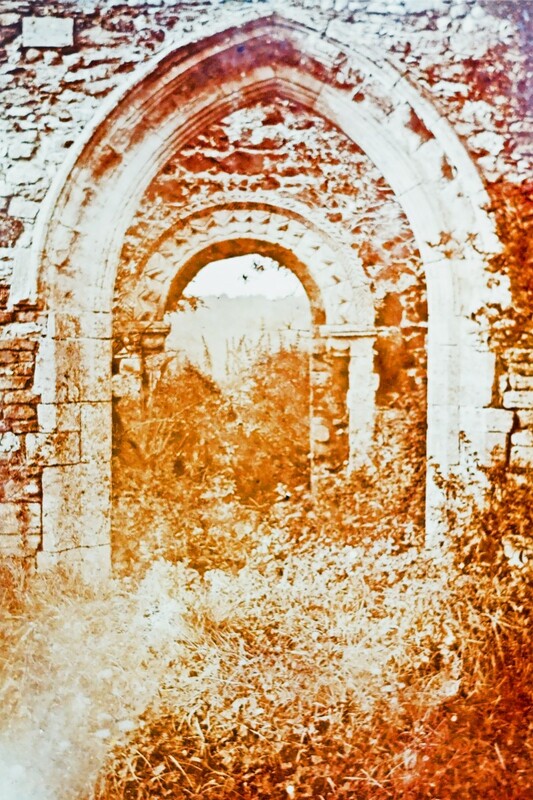 B y the 16th century the ruined church of St James at Bawsey was all that remained of the village. Occasional services are still held and shown opposite is a Harvest Service and Picnic when we joined with St Faith's Church in Gaywood, King's Lynn. 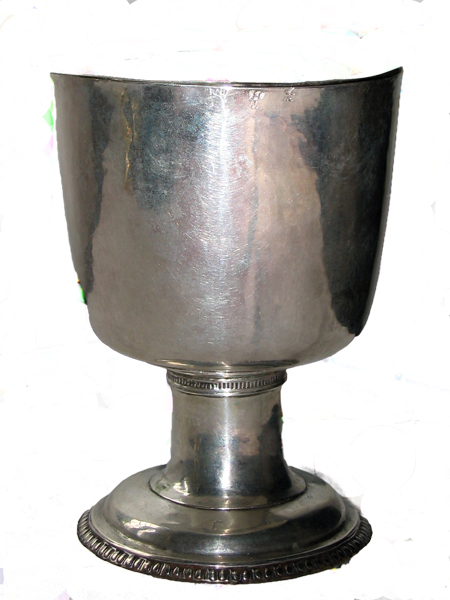 St Faith's holds the patten for the Bawsey Cup but the cup itself is in Ashwicken. It is a very rare piece of mediaeval silver, even more precious as it has a King's Lynn Assay mark. 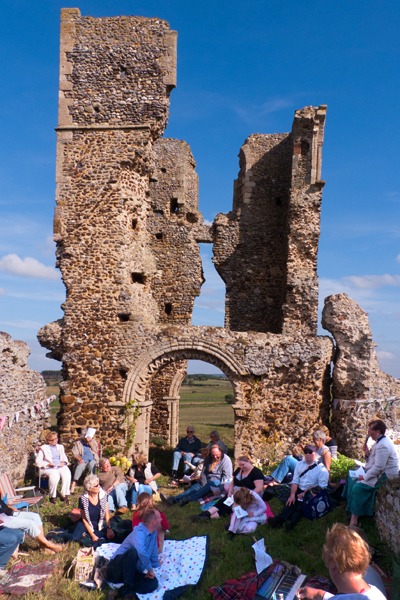 The church is designated as a scheduled ancient monument – one of more than 100 ruined churches in Norfolk & is a Grade 1 listed English Heritage Building. 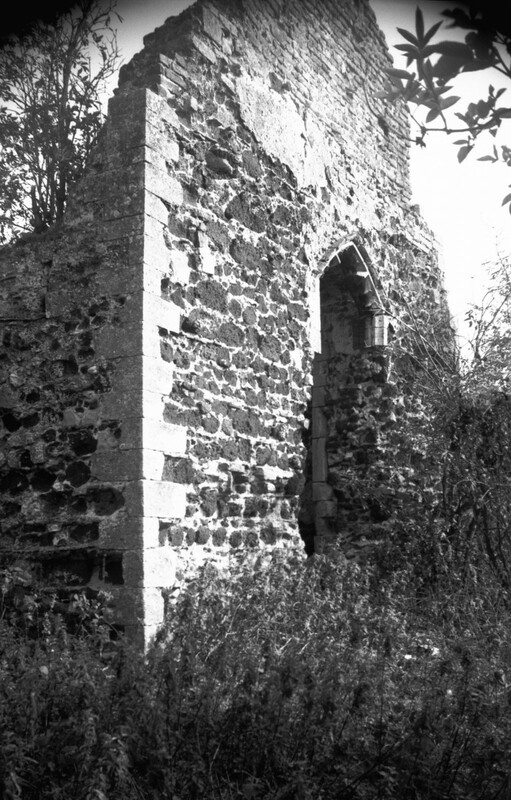 In March 1999, Channel 4's "Time Team" programme featured Bawsey St James ruins. The programme can still be seen on Channel 4 on demand. You will need to register to watch. click here. During the programme a skeleton was discovered that suggested a brutal slaughter. A burial with what appeared to be a sword cut of the skull. An analysis by osteologist Margaret Cox revealed the individual to be a robust female, who in the context of the Bawsey site may have been a nun. It turned out, however, that her demise was likely to have been a surgical operation that failed. The detached bone was not from a sword wound at all, but was in fact an attempt to save the woman's life by the surgical procedure of trephination some 1300 years ago. 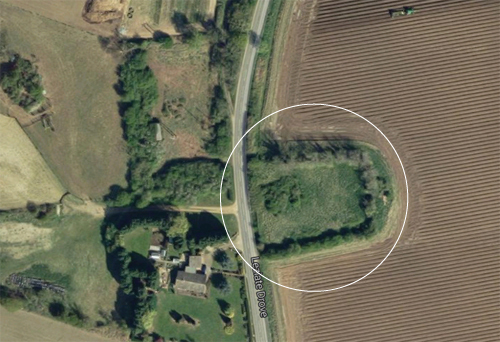 The map above shows the position of the lost Church of Leziate and below is the location shown in a satelite view today. Leziate was recorded in the Domesday Book in 1086 and was held by a ‘Roger Malet’ – a Norman knight who came to England in the Norman Conquest of 1066. Apparently he held great power in East Anglia, and five of his descendants became Earls of Norfolk. The medieval village of Leziate was once much larger, but the village had shrunk sufficiently by the late 15th century (that is around 1470 – 1500) for the parish of Leziate to be united with Ashwicken. All Saints’ Church in Leziate was in ruins by the 17th century (between 1601 and 1700), and there are now no upstanding remains of the building, although medieval building material, floor tiles and human remains have been found on the site. Pottery dating from the Late Saxon to the post medieval periods (post-medieval period classified as 1539 onward) and a medieval casket mount have been recovered from the fields surrounding the site of the church. A small mission church to seat about 100 was erected in 1883 at Brow of the Hill, Leziate but that is now a private house. The will of a John Shellacres of Leziate dated 1567 whilst the Church was still in full use can be viewed by clicking here. The overgrown ruins of the medieval church stand isolated in a field behind the Crematorium. Sections of the north and south nave walls survive and are built of carstone, stone, brick and pieces of metal working debris. Fragments from a 11th or 12th century arch are now in King's Lynn Museum and the font is now in a nearby garden. An old engraving of the archway held in the Fitzwilliam Museum, Cambridge. It seems the Church was abandoned in the 16th century and the 17th century saw a period of further decline. In 1602 the Church was served by a curate, with only 14 communicants. By the later 17th century, the Church fabric was evidently in decay and the Visitations record a steady deteriation. "The roof wants tiling of ye Church" in 1673 and in 1682 "The bell is riven ye clapper of it broken & ye rope wanting" In 1679, "There is noe font but they make use of a bason to baptise with. The Church is very much darkened by reason of the elder * ivy grow there & hinder the light & the ivy grow through the roofe into the Church." 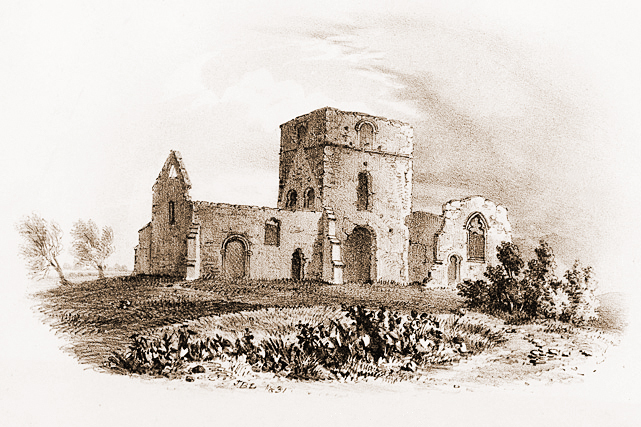 The church once stood within the village of Mintlyn, a settlement mentioned in the Domesday Book. Mintlyn was deserted during the post medieval period and its exact extent is uncertain, tough a map of 1690 shows five cottages near the site of Mintlyn Farm. You can read more of the Domesday Book here. With thanks to the www.opendomesday.org and Professor J.J.N. Palmer and George Slater. 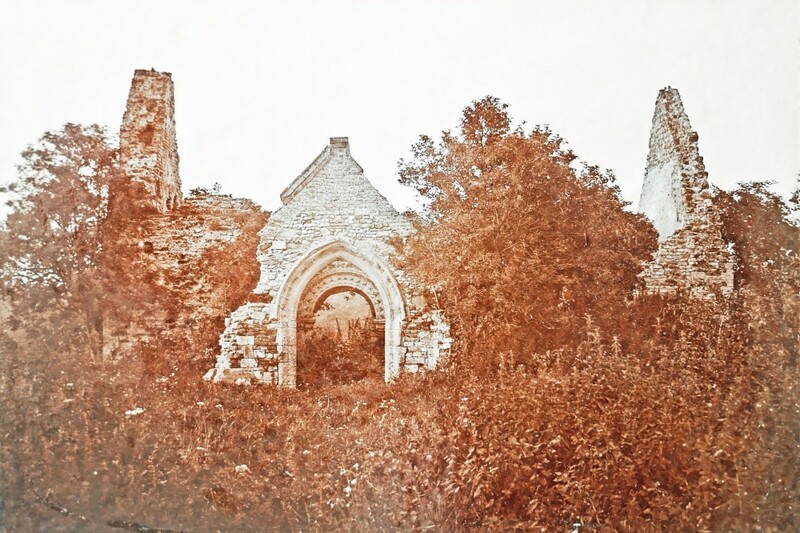 Very few photographs exist of Mintlyn and the ruins are now almost completely obscured. The photographs here are taken from an old frame held in Ashwicken Church but we do not know the date. We are very grateful for permission to publish the picture below , taken in 1996, showing what was left of the gable in 1996. © George Plunkett. You can see more old pictures of our Churches in our George Plunkett album, click here, and there are more Norfolk photo's at http://www.georgeplunkett.co.uk/Website/index.htm. Click here.